Fresh addition from the masters here at Pumaspeed. The new stock location manifold has taken inspiration and design from the American super power drag racers by using the super reliable 3.5mm walled stainless tubing. This HEAVY DUTY unit fits all std Focus RS and locates the turbo the standard position as other manufactures manifolds. Is there any benefit in choosing this manifold compared with other manufacturers? Yes certainly if reliability under extreme conditions is the main concern.The near 4mm pipework has proved itself to be the most reliable available in all the highest applications. Testing has proved more power. The entry angles at the collector are much more straight and direct which helps to reduce back pressure and increase flow,and let you power past the competition. Can Pumaspeed do a manifold to my specification , T3 flanged or externally gated ? External waste-gates can be catered for just call and ask A perfect Solution for heavy duty track, strip and fast road use. The Pumaspeed Workshop team are ready to fit the Focus RS GT25 Tubular Manifold in our Head Office located here. Therefore making parts and labour a total cost £1,067.99 (inc. VAT). 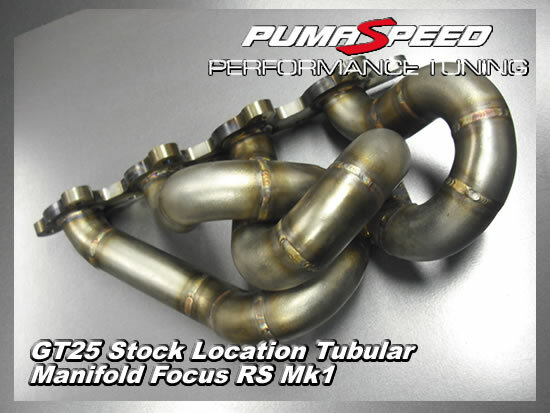 Pumaspeed have a specialist distribution team that can dispatch the Focus RS GT25 Tubular Manifold to any destination worldwide.